The Farmer’s Market at Butler Street is known for its variety of fresh fruits, vegetables and an understated charm. Unique in its own right, the market carries a distinct ‘hippie’ theme- from the clothes shops to the street performers! Take a walk through the market to sip on a hot cup of coffee while you are entertained with music and the general hustle bustle of the city. The market is set up only on Thursdays. Hire a Taxi or rent a bicycle to reach the market. You can walk to the market. How popular is Farmer's Market? People normally club together The Wreck and Cape Byron Lighthouse while planning their visit to Farmer's Market. Best markets I've been too. Love the live music and relaxed atmosphere while enjoying some yummy food. Love the Byron Candles. One of the best markets I have ever been too! Amazing selection and range of markets, with broad price ranges (from bargain finds to luxury items). Great vibes too - when I went there was an indigenous artist playing and a fab range of food. Spent a solid 2-2.5hours here! Delicious food vans, quality stores and some chilled live music. In summer it can get a little hot but there's some trees and shade tents to cool down under. 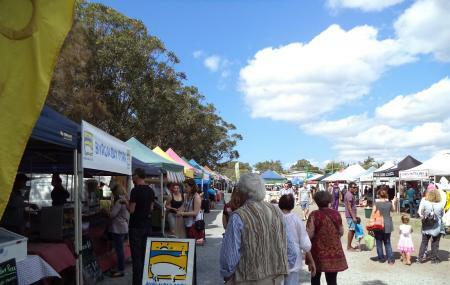 Byron Bay markets great for a visit different thing to buy homemade items thats what we look for when we got to the markets. Excellent array of local produce and wear. Good range of decorative items and baubles. There are some foodstalls as well with a good range of products and varieties of styles. Highly recommend Steve's honey stall, Gary's jams and chilly sauces, and the jerky stalls: the quality is superb and the prices awesome.